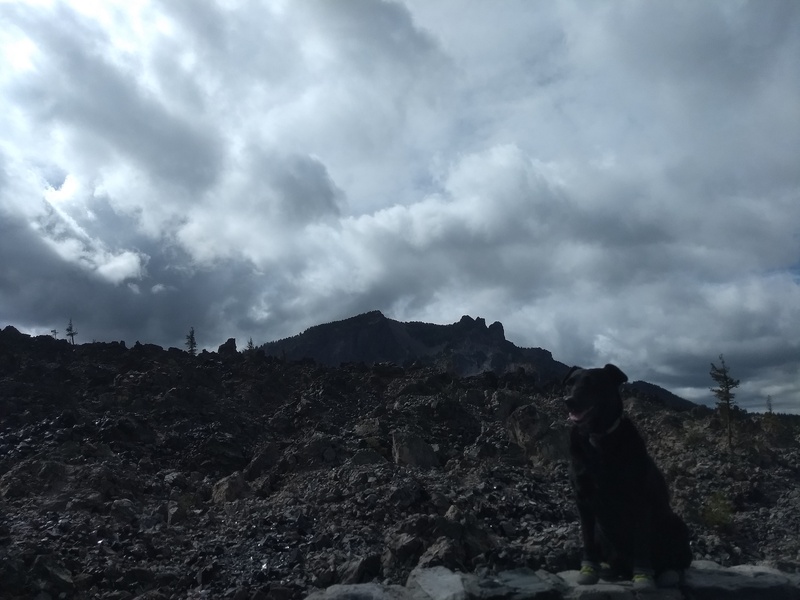 We had already visited both Paulina Falls and Paulina Peak and it was still only around noon. 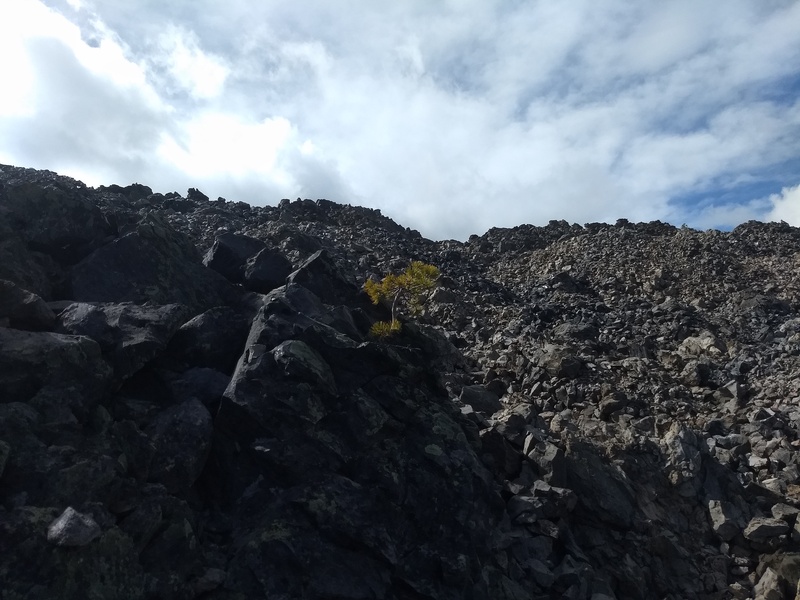 We decided to keep on exploring and visit this interesting volcanic feature that had peaked our interest when we had seen it while up at the Paulina Peak summit. 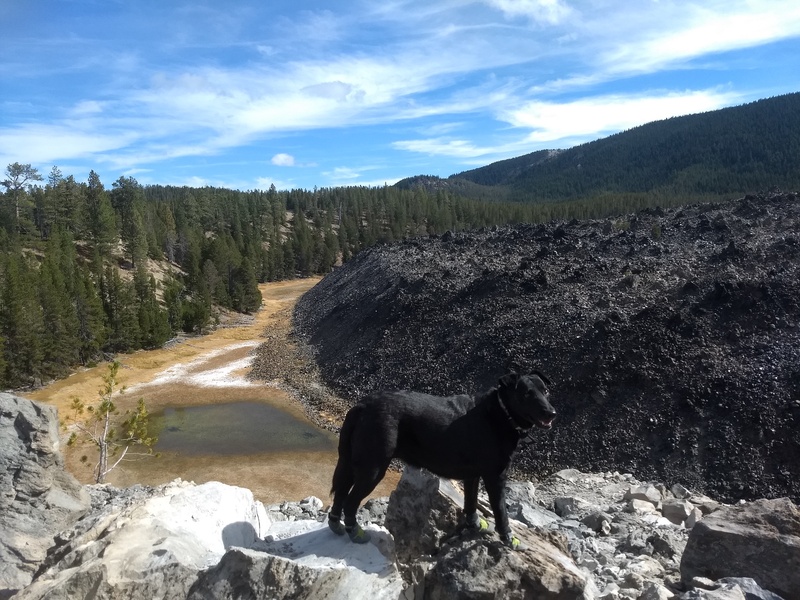 Once we got back down the hill from the summit we turned right and drove the 2 miles or so to the turn in at the Big Obsidian Flow parking area. 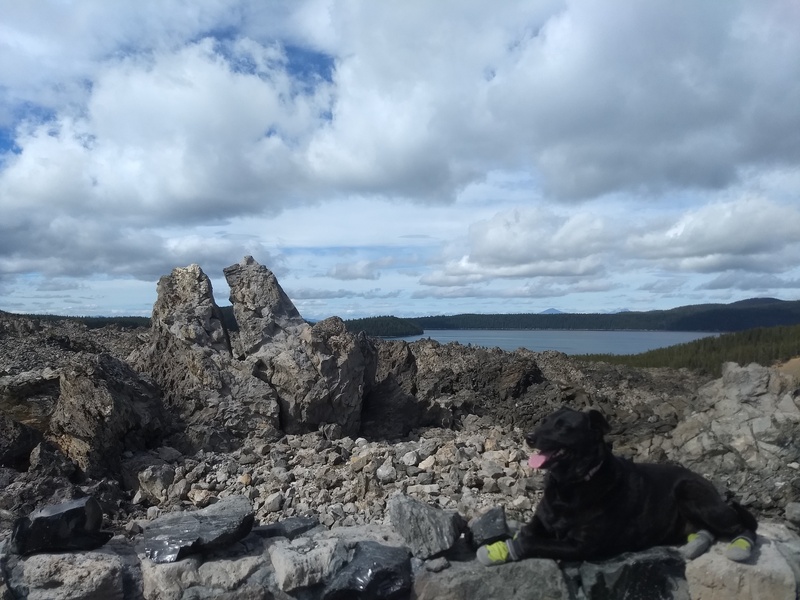 I had assumed that this was not really an appropriate hike for a dog because of sharp volcanic glass shards but we laughed in the face of danger and pulled out Willow’s Ruffwear Grip-Trex booties beforehand to protect her little Princess Paws. 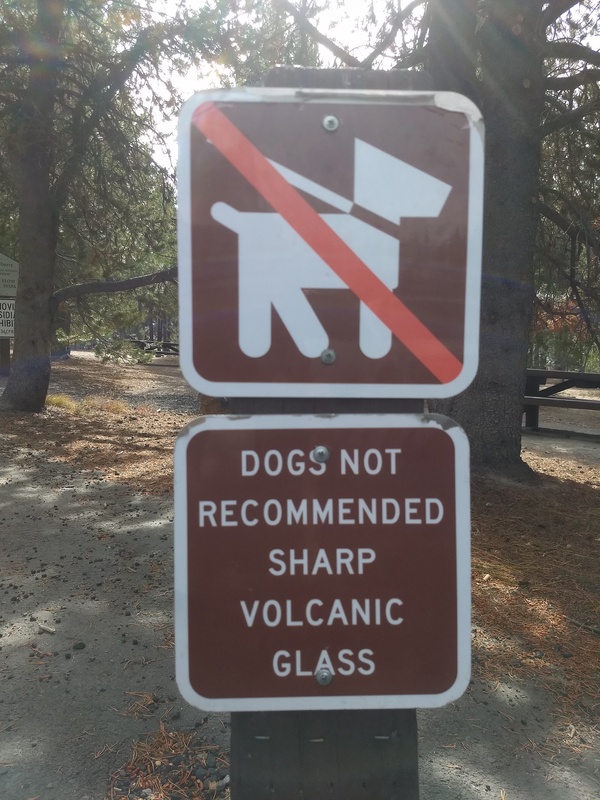 Just past the parking area we saw this sign which reinforced our decision to use these preventative measures. It had been awhile since she had worn her booties and so, as she got reacquainted with the feel of them, I was treated to a short bout of the moonwalking boot dance. Since this was not the first time she had worn these her little two-step was less severe and shorter than the 1st-timer above (not as high-stepping and took less than 20 seconds before she settled down) but two women sitting at one of the picnic tables nearby had a good laugh at her expense. If you find the need for booties such as these the Ruffwear website has a good page with some tips to help ease your dog into wearing booties. Right next to the sign in the above picture there is a paved trail leading up the hill and offering some views of the massive flow. We walked off the trail towards the base of one of the flow’s tendrils to get an idea of how massive this really is. Some facts: The flow averages 150 feet (45 m) in thickness which is the height of a 17-story building. The 1-mile long flow has an area of about 1.1 square miles (2.9 sq km) which is the size of 640 American Football fields or 400 soccer fields. 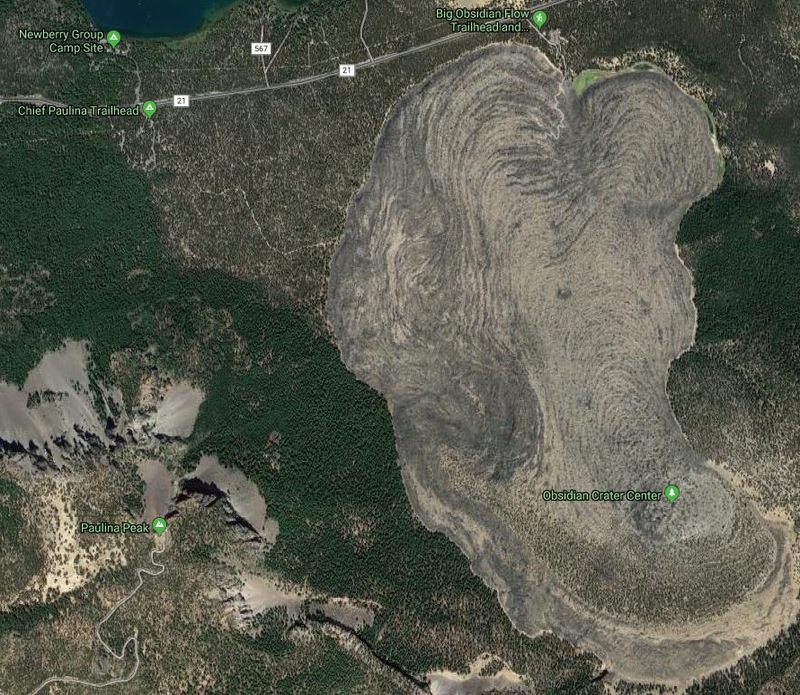 And while this is called the Big Obsidian Flow and technically is obsidian the surface is made up of about 90 pumice which is a frothy, bubbly obsidian and not the smooth, black glass that most people think of. Once we got back on the paved part of the path it quickly ended at a metal stairway. To the left was a log with a man holding his leashed dog as they were apparently waiting for others in their group to complete the trail. The guy gave us an annoyed (or longing) look – I couldn’t tell which…or care, when we started on up the staircase. His dog started whining and really wanted to come with us but, since it was lacking any protective doggie footwear that was just not going to happen. The stairs were constructed from one of Willow’s most hated things – expanded metal grating. 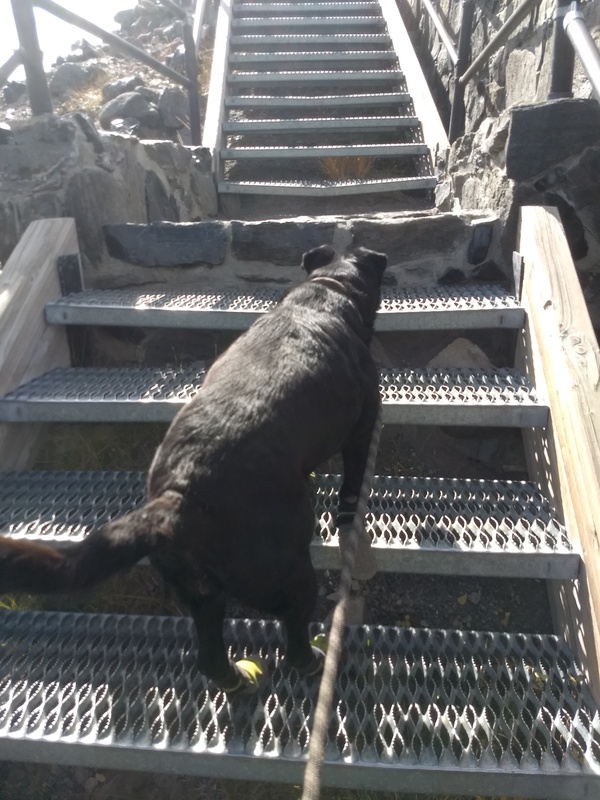 Here though her booties made that uncomfortable feeling of walking on such grating bearable and she led the way up to the top of the stairway. Once that torturous ordeal was over she took a quick break at a spot overlooking one of the leading edge tendrils of the flow and I took the opportunity to readjust all four of her booties. I have heard that some people don’t think booties are able to fit their dog’s feet well and give up after just one session. We have found that to get the best results using any booties requires this multi-step process: 1) When we first are putting them on we slip them up past the dewclaw (if they are that long) so that the toe area of the boot is actually up to the dog’s toes and then tighten up the velcro strapping – but not too tight. 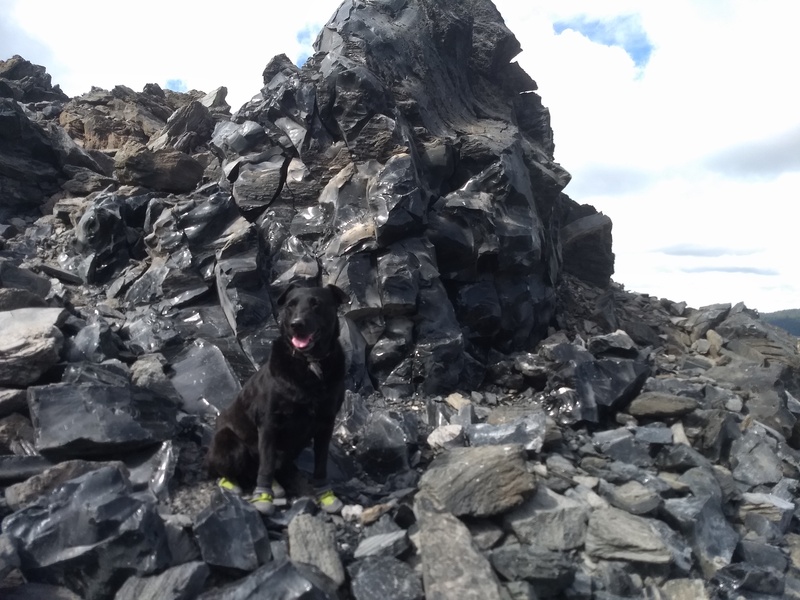 2) Then we start the walk, jog, hike or other adventure for about 5 minutes so that Willow’s paws get warm and loosen up, blood flows to them and they swell up the normal amount and the booties find their nice positioning on her feet. 3) At the first easy opportunity we stop and check the fit of the booties out and they almost inevitably have shifted, loosened up or slid down her foot enough that the toe area is now well past her toes, almost like she is wearing penguin shoes. One quick way to tell if this is happening: if your dog keeps “tripping over its own feet” while wearing booties they have most likely slipped down and the toe area of the bootie is longer than the dog’s normal foot and so it is having trouble using its normal gait. With a second adjustment back to a nice, snug fit and a re-tightening of the velcro strap they then usually stay in a comfortable position for the rest of the adventure. Booties newly adjusted we started our way up and around the half mile (0.8 km) trail that runs right through the obsidian and pumice flow. Here and there we saw small hints of green, a sign that life finds a way even in the most inhospitable environments. Taking a closer look, that little tree was twisted and gnarled much like a bonsai and was probably far older than its size would indicate. My “have-no-idea-what-I-am-talking-about” guess is over 20 years old. 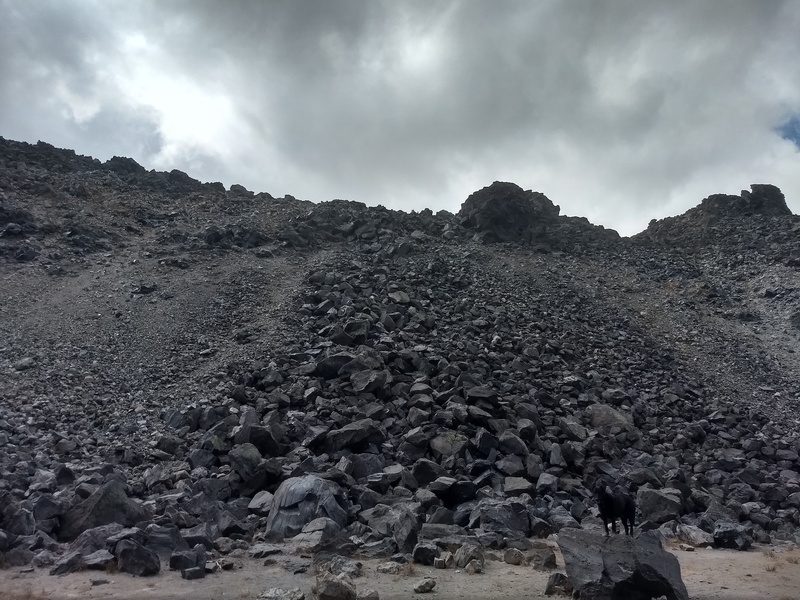 At many spots along the trail we found huge boulders of obsidian glaring shiny and black against the backdrop of matte and subdued colors. 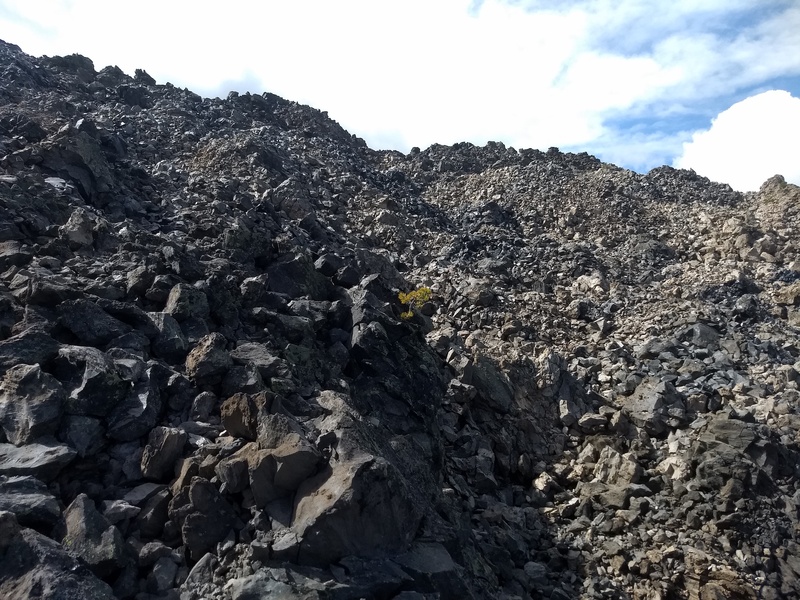 At about 1300 years old this lava flow is the youngest in all of Oregon. 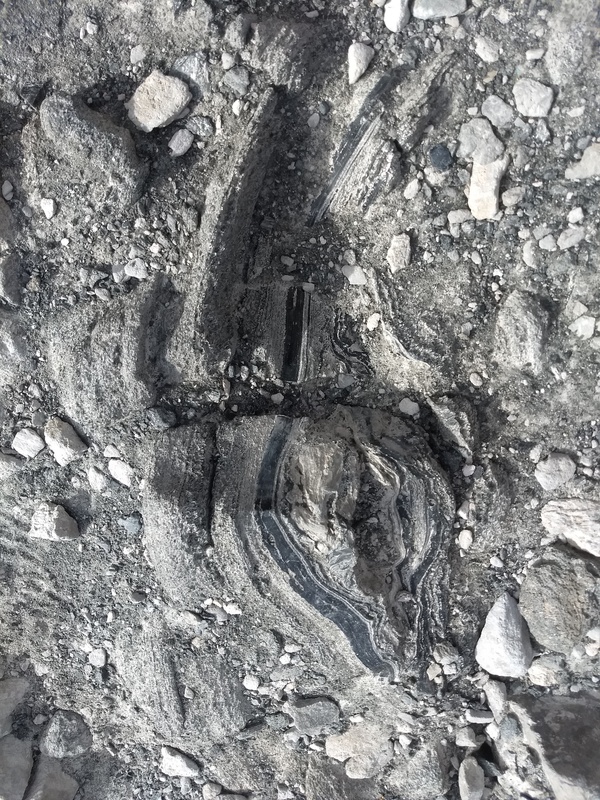 The entire surface of this flow was once glass that flowed as a liquid and then cooled without crystallizing. 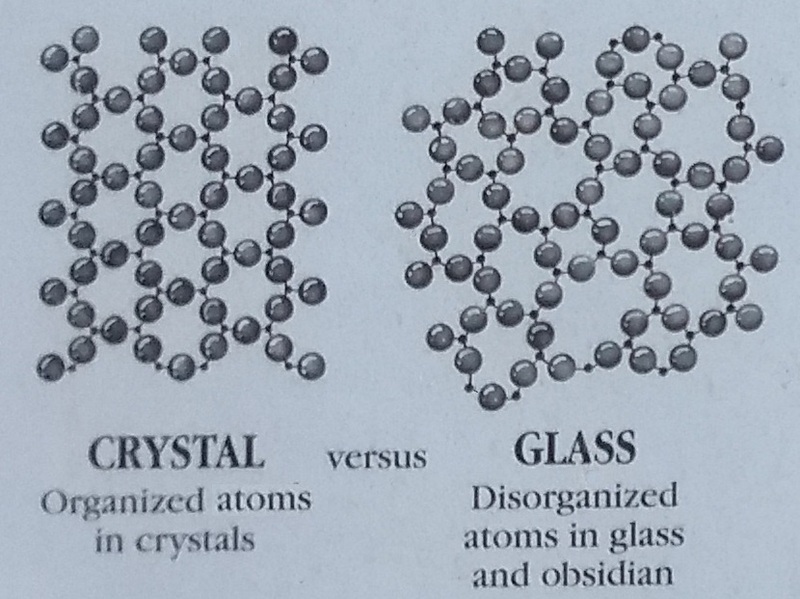 In a hot, molten state (like in lava) silica atoms stick together and slow down the organizational process which would have eventually ended up in a crystalline structure. The surface of this flow cooled off before that process had time to finish and so left glass, in the form of obsidian behind. Just like the glass you would find in a home window this obsidian and pumice contains about 73% silica which makes it a form of Rhyolite. The different colors are caused by the amount of bubbles trapped in the mix when it was molten and somewhat because of varying trace mineral amounts. Sometimes these different types and colors of glass end up in the same space when in their molten state and the results look like some forbidden, teeth-shattering swirled ice cream flavor. Soon after the eruption cooled native American people came from hundreds of miles around to collect the black glass for making a variety of useful tools and as a type of currency which could be traded for valuable goods like fish, root vegetables and shells. 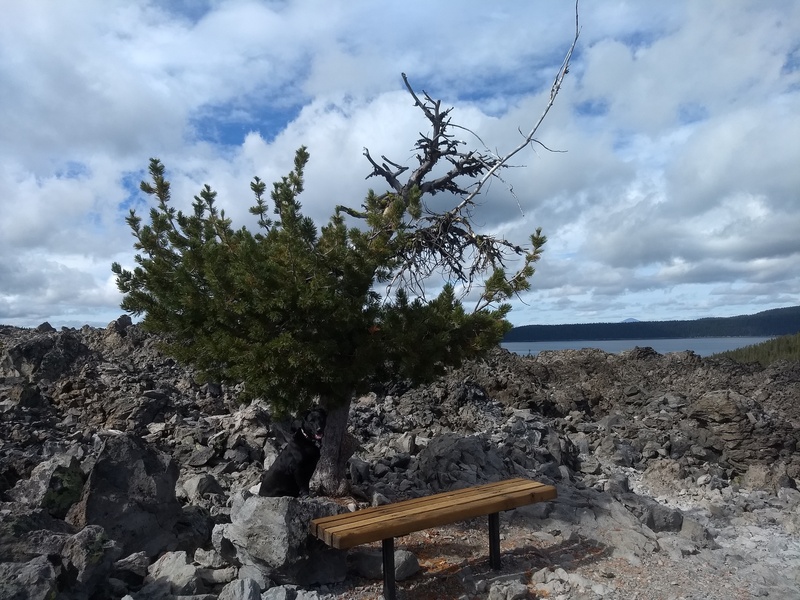 At the top of the trail there was a small wooden bench, shaded by the largest tree we saw on the flow itself, next to a platform area with views out over the flow, Paulina Peak to the southwest and Paulina and East Lakes in the caldera to the north. Looking back out to the West behind that tree we saw the blasted and unsymmetrical rim of Paulina Peak where we had just been an hour before. At first glance one might think this flow originated from Paulina Peak but the actual vent this came from is about a half mile past the end of the trail. 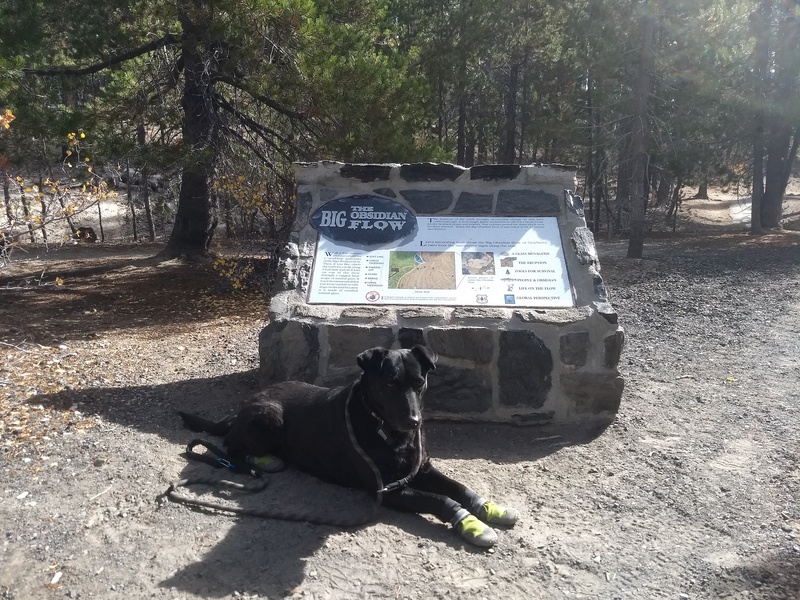 We met several other people on the trail and you could tell each one of them, at first, wanted to be critical of me bringing a dog on the trail and then they saw her booties and turned their frowns upside down. A couple of times we saw people putting small pieces of obsidian or pumice into their pockets and we were forced to be “that guy” who mentions that you really shouldn’t do that, it’s against the law, it’s also a douche move and if you really want a piece of obsidian or pumice you are welcome to head to the Glass Buttes (a bit past Hampton, OR on Hwy 20), where you can do so legally. Now you know. Sorry, not sorry. From the parking area to the base of the metal staircase is wheelchair accessible. 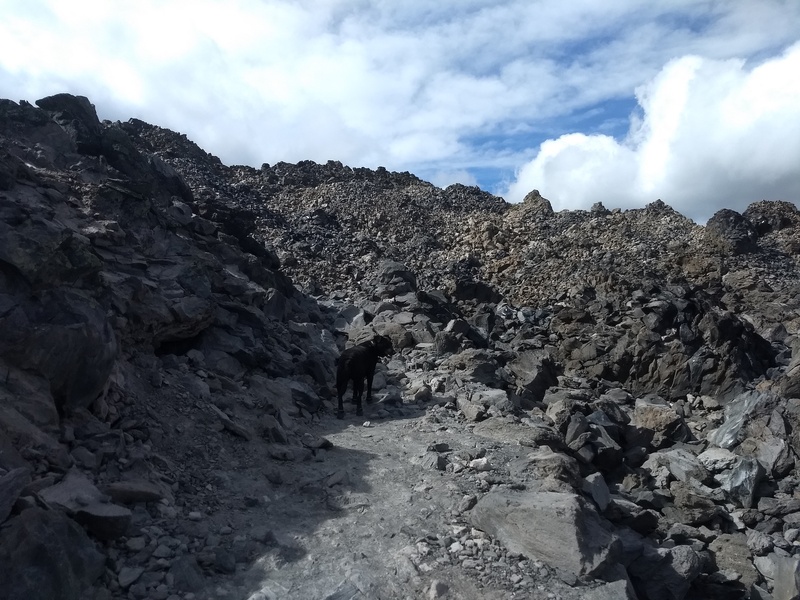 We did find that, even with our quality hiking boots on, there are more than a few spots with large chunks of slippery obsidian across the trail and even the best soles can slip off so be careful. Like our other two stops of the day this was an interesting, relatively easy hike that can be competed in about an hour. Being so close to the other two it would be a shame if you didn’t make the small extra effort to visit this fascinating area as well. If you’ve been here yourself feel free to drop us a line in the comments. If you liked this post or found it interesting please tell a friend. Keep Calm and Hike On.